From a modest machine shop in Baltimore to the surface of the moon, Black & Decker tools and accessories have proudly provided innovative solutions for over a century. Discover the pioneering legend of BLACK+DECKER; with a wide array of corded and cordless drills to reciprocating saws, Black & Decker has been setting the standard for innovation and design of power tools since 1910. 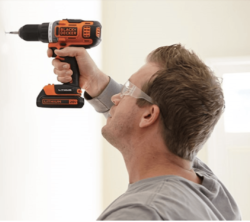 As the inventor of the first portable electric drill with pistol grip and trigger switch, Black & Decker offers a broad line of quality power tools used in and around the home and for commercial applications. When users need to get work done, they trust Black & Decker for the power tools that will do the job efficiently and reliably. As a Black & Decker authorized retailer, we welcome you to visit any of our locations today to see what Black & Decker tools & accessories we have that may best suit your needs! 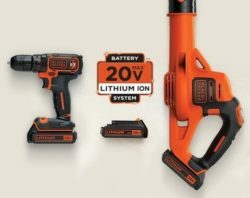 The 20V MAX* lithium ion battery system gives you the freedom to power a range of BLACK+DECKER power tools and outdoor equipment with long-lasting, interchangeable batteries. Because the tools in the system share batteries, you can get the convenience of always having a charged battery on hand. And you can save money by purchasing bare tools – tools that do not come with a battery. The 20V MAX* System – Power for Your Style.